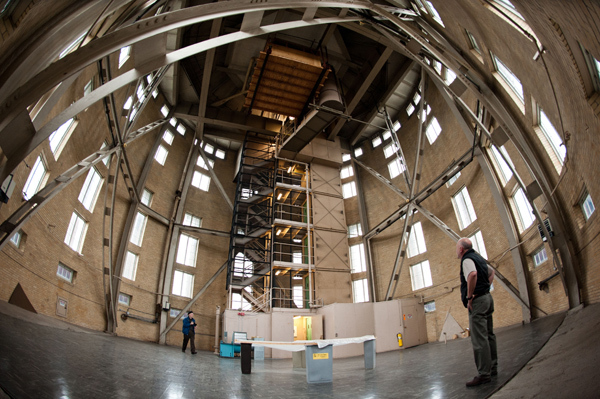 The bells of the Hopeman Memorial Carillon are permanently tuned, but require daily adjustments. Jeff Kabel ’12 and Emily Sumner ’15 modify the turnbuckles while Rachel Stuart ’14 watches. 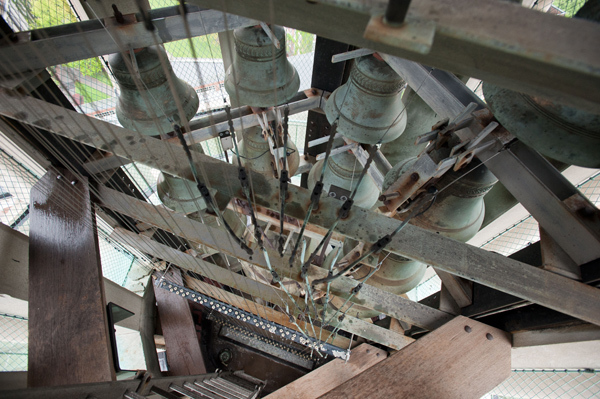 Housed in the lantern of Rush Rhees library, the 53 bells of the carillon are connected to the instrument’s keyboard through a system of cables that run from the player’s cabin to the bells. 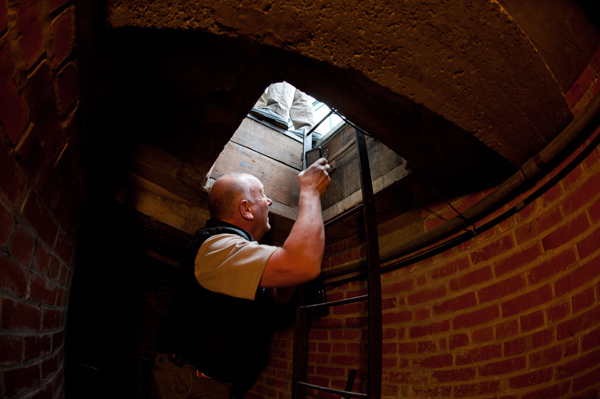 Barry McHugh, assistant director of River Campus Facilities and University Properties, climbs a ladder leading to the bells in the lantern, an area that’s not accessible to the public. Learning to play the carillon provides access to an area of Rush Rhees Library not seen by most students. The cabin, a large wooden box the size of a small room, from which the carillon is played is suspended in the tower of Rush Rhees Library at about the height where the original chime instrument was located. The steel frame was built to support the weight of the bells in the original chime. 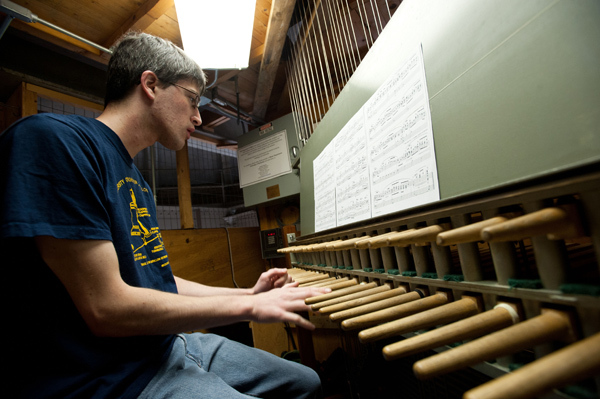 “We’re performing every time we’re up here,” says Doris Aman of student carillon players like Jeff Kabel ’12 (above). Even rehearsals can be heard across campus. 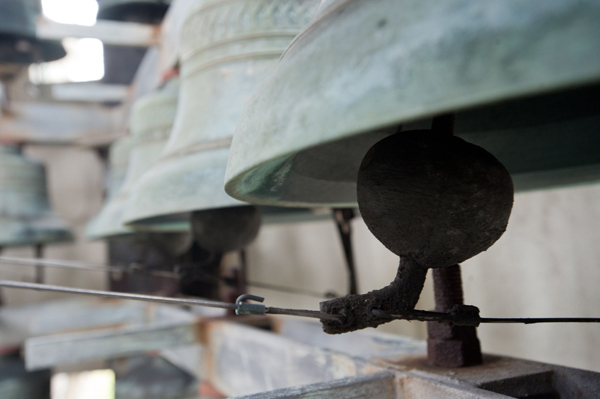 The 53 bells of the carillon span more than four octaves. 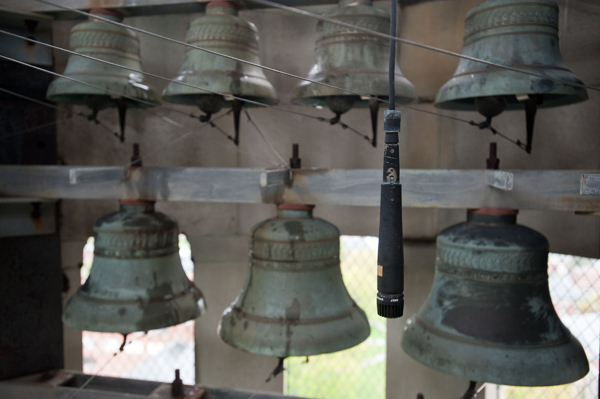 Because the carillon’s clavier is suspended below the bells, carilloneurs rely on a microphone located near the bells to hear what they are playing. Rachel Stuart ’14 and Kelly Guerrieri ’14 tune up a practice carillon in Spurrier Gymnasium. 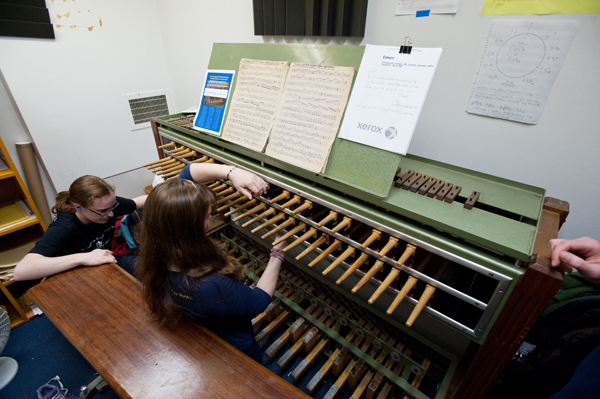 Students use the clavier-like instrument to get used to playing the Hopeman Memorial Carillon. 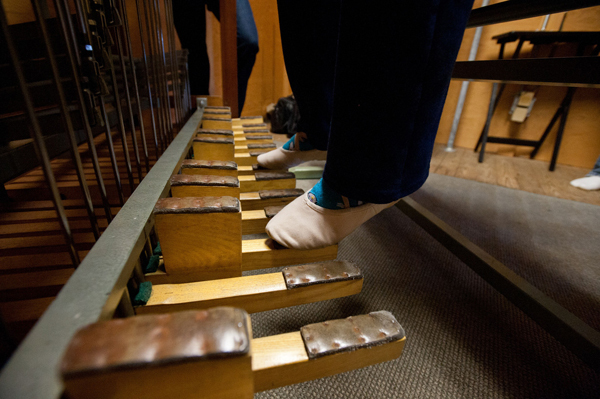 Kelly Guerrieri ’14 wears ballet slippers to get a better feel for the instrument’s pedals as she plays the carillon. 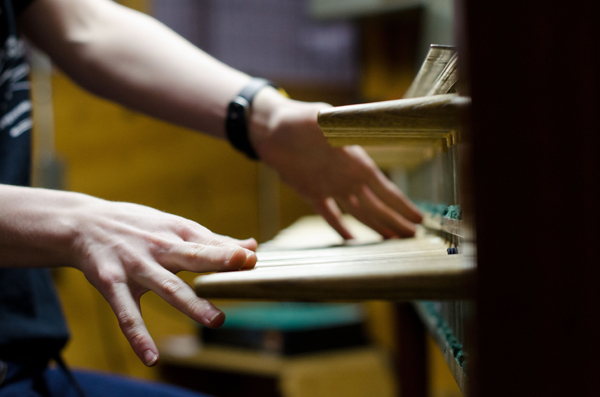 Carillon players have to learn to strike the batons of the instrument with large motions of the hands, as Rachel Stuart ’14 is learning to do as she plays the Hopeman Memorial Carillon. Jeff Kabel ’12 and Rachel Stuart ’14 train in the carillon cabin under Doris Aman’s watchful eye as fellow students Kelly Guerrieri ’14 and Emily Sumner ’15 look on. The sounds of the Hopeman Memorial Carillon waft over the Eastman Quadrangle with an almost ethereal prettiness. But behind those gentle tones is a machinery anything but delicate. Suspended in the dome of Rush Rhees Library is a wooden box the size of a very small room. This is where the carillonneur plays the music that fills the River Campus. She—in this case, physics graduate student Bethany Little—sits on a bench before a large keyboard and pedalboard that ring the massive bells that hang high above her, in the lantern of the dome. The music of the Hopeman Memorial Carillon was a highlight of this winter’s “Season of Nonviolence,” sponsored by the University’s M.K. Gandhi Institute for Nonviolence. See the video. Jeffrey Le ’08 is credited with helping re-ignite student interest in the carillon with a KEY project he completed while on campus. He demonstrated that the carillon could do much more than chime on the quarter hours. It could, for example, be the perfect place to play the theme from the Harry Potter movies. Playing the sweet sounds of a carillon is an intensely physical task. The 48 keys are in fact “batons,” wooden levers that must be depressed with the force of the whole arm. Little’s leg muscles visibly tense and relax as she exerts pressure from her thigh to her foot to push some of the 24 pedals down. It’s a paradox that has bewitched players since bells were installed in 1930, first as a chime and then, in the 1970s, as a carillon. For Guerrieri, an archaeology, technology, and historical structures major from Pittsburgh, the appeal was so strong that—after first hearing a portable carillon at a Renaissance festival—she applied only to colleges that had a carillon. “I wanted to learn to play it,” she says. Guerrieri’s not alone. 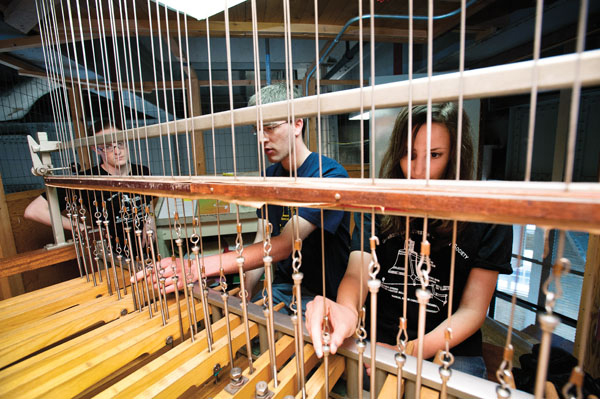 There is fresh appreciation for—and student interest in—the carillon these days, sparked in great part by Jeffrey Le ’08 (KEY), then a music major from Henrietta, N.Y. He earned a Kaufmann Entrepreneurial Year grant to bring back a student carillon society, a successor to the Bellman Society that flourished at Rochester in the mid 20th century. “Student interest was already there. There just wasn’t an outlet for it,” says Le, who is now working as a clinical research coordinator at the Center of Resuscitation Science at the Hospital of the University of Pennsylvania. He’ll start medical school in the fall. Le visited other campuses—including Cornell, Berkeley, and Alfred University in nearby Alfred, N.Y.—where students play their school’s bells, to investigate teaching models that would fit well at Rochester. He became a proficient player, thanks to mentoring by Tiffany Ng ’08E (MM), a graduate of the Royal Carillon School “Jef Denyn” in Belgium, who worked to promote the carillon while a student. Le’s primary way of publicizing the carillon was simply to play it, to make it a familiar sound of the campus and let listeners know the bells could do much more than play quarterly chimes each hour. He gave noontime concerts weekly, and arranged his own music—especially music that he knew would resonate with fellow students. A YouTube video of Le playing the theme music from the Harry Potter movies became a minor web sensation, picked up by outlets such as the Huffington Post. “It brought about an awareness of what could be for the carillon. I would tip my hat to him—he was the spark,” says Josef Hanson, manager of music performance programs in the Department of Music in the College. Since Le’s graduation, Doris Aman has taken up his work. An adjunct instructor of the carillon, she’s bringing students to the carillon, organizing the University Carillon Society, and providing lessons to any interested pupil of the instrument. 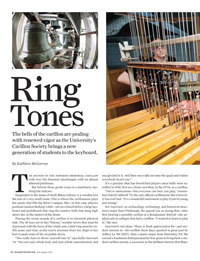 While the number of players is growing, most people experience the carillon, of course, as a listener. It’s a consequential role. “Part of the secret of a good chime is in the foundry, part is in the tune, and part is in the wind, but most is in the imagination of the listener,” English professor and bell player John Slater once wrote of the Hopeman Memorial Chime, the carillon’s predecessor. The bells also reach across years. They were born at the birth of the River Campus, when the music of bells was enjoying a revival after the metal industry was freed from the constrictions of wartime production for World War I. Those planning the new campus imagined installing a carillon when, in 1926, they contemplated what had been Oak Hill golf course. But costs were high—import charges, for example, increased the cost of bells bought in Europe by 40 percent—and Rochester’s ambitions were scaled back, and back again. Plans for a carillon—which must have 23 or more bells—became plans for a chime, which has fewer than 23 bells. At one point cost-conscious supporters discussed the possibility of buying just one bell. To the rescue came the Hopeman family. A native of the Netherlands, where bells have long been popular, Arendt Hopeman arrived in the United States in 1868. One year later, he founded the construction company—later incorporated as A. W. Hopeman and Sons, General Contractors—that oversaw construction of the River Campus, the Eastman Theatre, and the Eastman School. He died in 1928, and to honor his memory and his Dutch heritage, his children—Margaret Hopeman, Class of 1903, who earned a master’s degree in 1906, Albert, and Bertram Cornelius—made a gift of a 17-bell chime forged by Meneely & Co. In the bell business since 1826, Meneely’s foundry branch of Watervliet, N.Y., had already created bells for locations such as Valley Forge, Pa., and Cornell University. The bell lantern atop the dome of Rush Rhees library was added specifically to house the chime. The bells were so immense that they required additional heavy steel girders for the dome, a cost that the Hopeman family bore. The original bells installed in the library weighed more than 17 tons. Two more bells came in 1956, adding six more tons to the weight and giving players a greater range of tones. The largest of the bells—the second largest ever cast at the Meneely foundry—weighed 7,500 pounds. It was said to be one of the deepest-toned bells made outside Europe at the time. The chime was played first by Slater, who served as University bellman from 1930 to 1940, during which time he arranged 200 tunes for performance. He was succeeded by Robert Metzdorf ’33, ’39 (PhD), later an honorary trustee and curator in the Department of Rare Books in the 1930s and ’40s. When Metzdorf, who earned the first PhD granted by the English department, stepped down in 1949, students took on the role as members of the newly established Bellman Society. It wasn’t an entirely glamorous service. So as not to disturb students working in the library, the bells were sealed off from the body of the library. Consequently, players had to open a window to hear the notes they struck. In the already less than toasty dome, an open window in the small chamber that housed the chime’s keyboard made for sometimes frigid conditions for the players. Members and former members of the Bellman Society numbered almost 100 by the time the chime was decommissioned after 40 years, due to deterioration. An inspector of the chime, James Lawson, carillonneur at Riverside Church in New York City, advised in 1966 that the University should replace the chime with a lightweight carillon—a suggestion acted on with the help of an endowment for the maintenance of the bells given by the Hopemans. 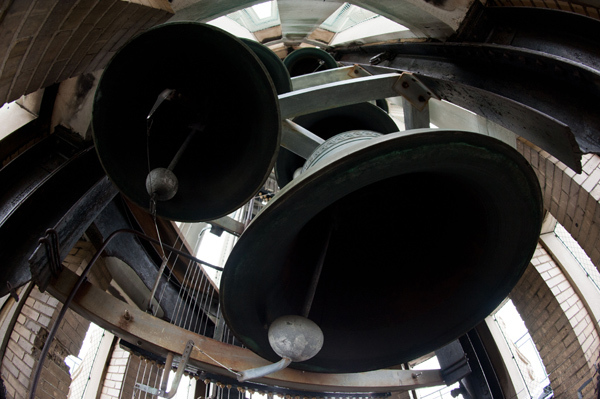 None of the chime bells was incorporated into the carillon because of limited space—and out of consideration for students at work in the library or sleeping in nearby residence halls who would be disrupted by too loud an instrument, says Aman. Six of the 19 chime bells moved to Christ Church on East Avenue in Rochester. The others were sent to Europe to be melted down so their metal could be re-used. The bells for the new, 50-bell carillon were also cast in Europe, at the Royal Eijsbouts Bellfoundry in the Netherlands. They were installed in November 1973 and dedicated, at a gala celebration, that December. Emily Sumner ’15, a brain and cognitive sciences major from Bedford, Mass., heard the music playing on campus and wanted to try it. A singer who plays the piano and is also learning mandolin, she’s been studying with Aman since early in her freshman year. In the carillon cabin with physics graduate student Bethany Little, Aman coaches her to adjust how high above the batons she holds her hands—the further the drop, the greater the force, and the louder and longer the bells sound. “One of the first skills I teach students is to listen to their bells,” says Aman, who learned to play on the Davis Memorial Carillon at Alfred University—one of just seven carillons in the state. She often brings two students at a time up to the dome, or to the practice keyboard in Spurrier, which is attached to something like a xylophone, so that they can distinguish the tones they strike from those of their partner. Bells may seem fairly indestructible, but players need to stay attentive. If a clapper slams a bell and doesn’t release, it makes a clunking sound. Playing the bells in temperatures below 32 degrees may crack or tear the original leather straps. And if a carillonneur forgets to turn off the automatic chime—a Westminster Chimes mechanism was a gift from the Class of 1951 and was designed and constructed by the University’s chief electrician, Arthur Hughston, then replaced by a Verdin electronic chime—the bell can be damaged by the simultaneous striking of the player’s interior clapper and the chime’s exterior hammer. “She’s training you from the beginning to teach other people what you know,” says Guerrieri, who has recently become a mentor. Le recommended, and Aman is working to foster, a system by which students reach a certain level of proficiency and then begin instructing others. The bells ring as students take lessons and practice; there are performances at commencement ceremonies and other celebratory or solemn occasions through the year; and on various July evenings, carillon fans spread out across the Eastman Quad to enjoy the performances of visiting carillonneurs. That tradition flourished in the 1980s, when picnickers would compete for best costumes, best menus, and other honors. It was serious battle: one group recreated the final luncheon served aboard the Titanic; a Middle Eastern feast featured a belly dancer. “Picnics on the Quad” produced two cookbooks and, say those who were there, a host of happy memories. “Those were the glory days,” remembers Andrew Stalder ’48, who sponsored the guest artists. A violin major at the Eastman School until he left to serve in World War II, he joined the Foreign Service after his graduation and never returned to the violin. “Music was to be my career, but the interruption of the war changed my focus,” he says. But after returning to Rochester in 1979, he saw a photo in the paper of David Caldwell performing at the carillon keyboard, and an old love took a new form. 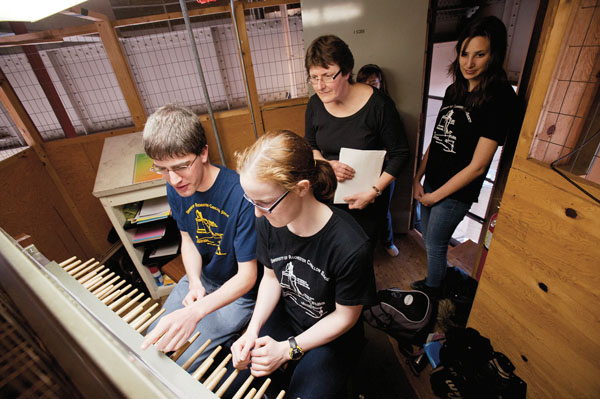 Stalder—a lifelong student of the piano who studies still at the Eastman Community Music School—took lessons from Caldwell and ultimately became a carillonneur qualified by the Guild of Carillonneurs in North America. He performed on the Rochester instrument until 1992, when he decided at age 70 to retire from the vigorous performances and from the then rather treacherous trip to the carillon, which was reached by a catwalk in the dome. “It was terrifying,” Caldwell, too, recalls. The space has since been renovated to make it safer and easier to navigate. It was more than fun, it seems—he stayed not one year but 11, working part time to maintain the carillon, teach students, and perform while also working in computing at the Eastman School. Fackenthal’s story is exceptional, but Hanson hopes that all will find the carillon central in some, perhaps ineffable, way to their time on campus. An exhibition, The Builder’s Bells: The Hopeman Memorial Chime and Carillon, is on display in the Great Hall at Rush Rhees Library through September 30. To learn more about this July’s schedule of concerts, visit www.rochester.edu/College/ MUR/concerts.